A smartwatch concept developed by a research group at Dartmouth allows wearers to experience games and videos with 3D touch. RetroShape, which will now form part of Darmouth's offerings at UIST Symposium 2017 (User Interface Software and Technology), uses tactile pixels on the underside of the watch in order to extend the watch face's output, meaning the feeling of a ball bouncing on screen is felt in the same position on the wrist. And if you were watching a movie with an explosion, the same tactile pixels — known as taxels — would correspond to the position on the device. 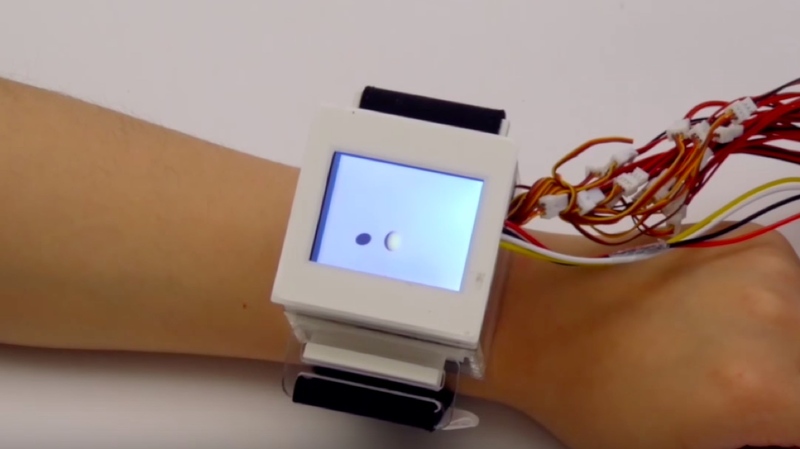 The project was undertaken to improve user experience with smartwatches, with the construction allowing developers to harness the same ability to match visuals and haptics together. And while the smartwatch concept looks to explore an area of smartwatches, which currently only provides basic feedback, it's not the only piece of wearable tech submitted to the UIST by Dartmouth. Frictio, a ring which uses six individual force profiles to help provide information to the user, will be featured, too. And while its applications are simpler than the RetroShape, users are still privy to the like of calendar reminders. For example, if a wearer had a meeting scheduled to begin in five minutes, the ring would not be able to move, whereas if the calendar was free the device would offer another force profile and be able to move around a finger with ease. Like with most research concepts, the design element is far from fleshed out on both pieces of kit. However, the applications certainly have potential for wider exploration. Gaming and videos, as an example, aren't currently a big factor within smartwatches, but adding an extra dimension to the experience like RetroShape could help that change. Until these ideas make their way to the mainstream, though, we'll continue dealing with basic haptics on our watches and wearing smart rings without force feedback.